A mass-storage device is electronic hardware that stores information and supports a protocol for sending and retrieving the information over a hardware interface. The information can be anything that can be stored electronically: executable programs, source code, documents, images, spreadsheet numbers, database entries, data logger output, configuration data, or other text or numeric data. Mass-storage devices typically store information in files. A file system defines how the files are organized in the storage media. 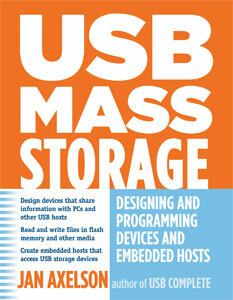 My Mass Storage page contains links to firmware using the example code in the book, plus links to chip and other product information and much more. In technical writing, clarity is the name of the game. As someone who writes technical prose, I greatly admire Jan Axelson; she knows better than almost anybody else how to write clearly and how to explain complex technical issues so that her audience can understand them with minimal frustration. - EDN. From handling commands and data errors to interface specs, manipulating FAT file systems, and more, USB MASS STORAGE provides project managers and developers with all the basics on using industry standard commands, controllers, and ports. - Midwest Book Review/California Bookwatch. 287 pages, 7" x 9"